Fórsa trade union has signed an agreement with Ryanair making the union the sole negotiating union for directly employed Ryanair cabin crew in Ireland. The agreement was signed yesterday (Wednesday 29th August) by Fórsa officials, cabin crew representatives and Ryanair management. Fórsa official Ashley Connolly said the agreement marked a new, and very significant, milestone in the development of collective bargaining at the airline. This is a very positive development and we’re proud to be in a position now to represent Ryanair cabin crew. Ms Connolly said: “This is a very positive development and we’re proud to be in a position now to represent Ryanair cabin crew. We’ve been working with our cabin crew members towards this securing this agreement. “Together we look forward to growing our membership and securing improvements in terms and conditions as the negotiating union for Ryanair cabin crew,” she said. It is important that, for the first time in Ryanair, cabin crew members have a voice. Ms. Connolly said the union will also seek engagement with cabin crew agencies contracted to the airline. Speaking to Newstalk FM this morning, Ms Connolly said the union wouldn’t be intimidated by Ryanair’s approach to industrial relations: “I think that Fórsa has proven itself over the years to be equally as tough when required and when needed. 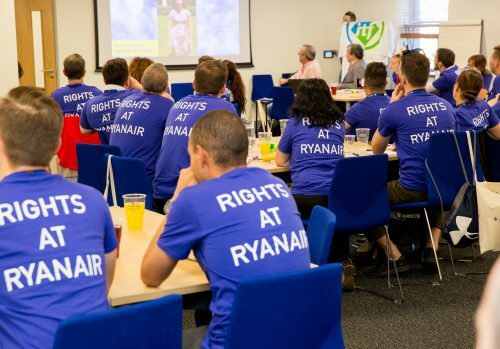 “It is important that, for the first time in Ryanair, cabin crew members have a voice. They will be to the forefront of any discussions I have and they will be present at every meeting that I carry out with the company,” she said.